The Park Geun-hye administration kept parts of the 2015 Korea-Japan agreement on Japan’s wartime enslavement of Korean women in the dark, a South Korean task force confirmed Wednesday. The administration also pushed the deal despite the pact falling short of fundamentally resolving related issues. “A victim-centered approach, which has become the norm when it comes to the human rights of women in times of war, was not sufficiently reflected and the deal was reached through give-and-take negotiations like an ordinary diplomatic agenda,” a Foreign Ministry task force review released Wednesday said. The report addresses the controversial agreement signed between the Park government and Tokyo in 2015, which pushed both nations to “finally and irreversibly” put the “comfort women” issue behind them. “Comfort women” is a euphemism for women who were forced into sexual slavery for the Japanese military during World War II. “The previous administration under former President Park Geun-hye used resolving the comfort women issue as a prerequisite to improving bilateral ties between South Korea and Japan, but its inflexible responses resulted in several burdens,” it added. A team of nine public officials and experts looked into the yearslong negotiations and related procedures in the run-up to the announcement of the accord on Dec. 28, 2015, in a series of 20 meetings held over five months. A comprehensive database of relevant documents were provided by the Foreign Ministry here. The report said that the decision-making power was excessively concentrated in Cheong Wa Dae at the time and the South Korean government was incapable of separating historical issues from security and economic issues, when dealing with the matter. It noted insufficient cooperation and communication between the presidential office and the Foreign Ministry. The task force also confirmed the speculation that the previous government compromised too much and that this was undisclosed to the public to avoid backlash. Among the talks kept in secret, Japan told Seoul to refrain from supporting relevant civic groups disagreeing with the deal and to stop using the phrase “sexual slavery.” It also requested detailed plans regarding “girl statues” installed in front of the Japanese Embassy in Seoul. Japan has often expressed its displeasure over civic groups’ movement to build “girl statues” embodying comfort women across South Korea and in other countries. In response to Japan’s requests to remove the statues, the South Korean government said it had no authority to stop them but vowed to persuade the civic groups through consultation. “The undisclosed agreements did not directly block the South Korean government from relocating ‘girl statues’ nor using the expression ‘sexual slavery,’ but provided the Japanese government with an excuse to get involved in matters,” the report said. The task force also said that despite the agreement, the issue remains largely “unresolved,” as the victims have not yet embraced it as a form of apology. South Korean Foreign Minister Kang Kyung-wha on Wednesday acknowledged a significant lack of communication with “comfort women” victims here, in reaching the agreement. The report also shed light on Japan’s reluctance in acknowledging “legal responsibility,” which the victims and civic groups here view as a sign that Japan is not ready to make a formal apology. Instead, Tokyo made a 1 billion yen ($9 million) financial contribution to a victims’ trust fund created by the agreement as its reparations mechanism, the report noted, but refused to link the money to any legal responsibility. “Following the agreement, Japan has been saying that the fund is not linked to any legal responsibility,” it said. The report said the size of the fund was not set through an “objective standard of calculation” and the task force failed to find records showing that the South Korean government took the victims’ opinions into consideration during negotiations. It said that Japan is refusing to acknowledge formal legal responsibility for its actions because it believes the “comfort women” issue was already resolved through the deal. But acknowledgement of legal responsibility for its crime was one of the key demands of the victims. On the term “irreversible” in the agreement, the task force said South Korea initially used the word to make Japan’s apology more “official,” but it was later distorted in context when Tokyo used it to describe the “comfort women” issue, in subsequent talks. Kang said in Wednesday’s press briefing that the government will “faithfully” accept the task force results and carefully form a stance on the issue, with South Korea-Japan relations in mind. President Moon Jae-in in May said he will revisit the deal, and the current administration said it would pursue a two-track approach of separating historical issues from diplomatic ties to Japan. 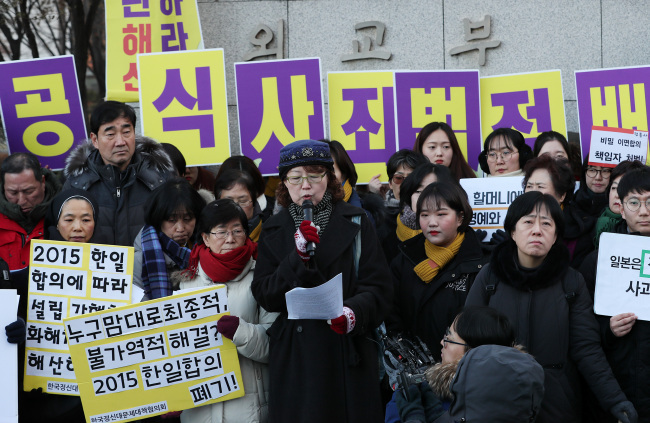 Historians estimate up to 200,000 women, mostly from Korea, were forced into sexual slavery. There are currently 32 surviving “comfort women” victims in South Korea.